Technavio analysts forecast the global blockchain identity management market to register a CAGR of over 81%, according to their latest market research report. However, the growth momentum of the market is expected to decelerate due to a decline in the year-on-year growth. The growth of quantum computing is one of the major trends being witnessed in the global blockchain identity management market 2018-2022. Quantum (News - Alert) computing refers to the use of quantum-mechanical phenomena, such as superposition and quantum entanglement for data processing and computation purposes. Instead of bits, which conventional computers use for data processing, quantum computers use qubits. These qubits can store a considerably large amount of data and perform exponentially fast computing while using less energy. Currently, a few organizations are developing quantum-based block-chain solutions. Moreover, these systems will allow for a more future-proof block-chain technology, which would maintain data security for end-users and be impossible to hack. Thus, these advantages are expected to lead the overall market towards a positive outlook during the forecast period. Blockchain identity management can provide a single sign-on capability across all online services and platforms. This will eliminate the resetting and managing of various password. Blockchain identity management services allow end-users to manage access to all their accounts and applications using a single user identity and authentication factor. This saves the end-user significant time while accessing their services across multi-domain cloud-based or virtual applications. According to a senior analyst at Technavio for research on IT professional services, "The demand for online security and increase in cybersecurity regulations are two factors that are expected to boost the growth of the market in the next five years as several enterprises would adopt the blockchain application for convenient and efficient functioning of the organization." 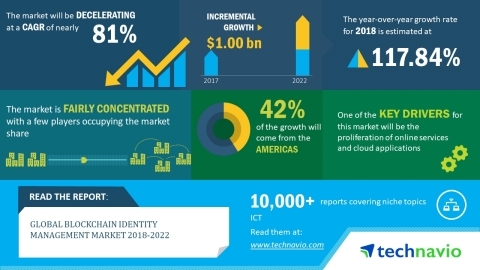 The global blockchain identity management market research report provides market segmentation by application (end-point, network, and infrastructure), by end-user (BFSI), and by region (the Americas, EMEA, and APAC). It provides an in-depth analysis of the prominent factors influencing the market, including drivers, opportunities, trends, and industry-specific challenges. The Americas held the largest share of the market in 2017, accounting for over 41% share, followed by the EMEA and APAC respectively. The US recorded substantial investment and private funding in the blockchain identity management and other blockchain-related technologies in the recent years, which contributed to the high market share of the Americas.